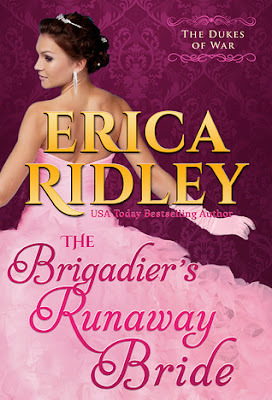 I had heard so much about The Dukes of War series and so when I saw The Brigadier's Runaway Bride by Erica Ridley, I decided to give it a try. The cover is beautiful, the blurb interesting and the title intriguing enough to grab the reader's attention. The plot is promising and while I read a book with a similar plot in the past, the execution of the two books make them different. The author brings out a love story that should have ended in a happily-ever-after after the hero returns back from dead but instead this is where this story starts. The turmoil of changed personalities, their confliction emotions, the misunderstandings and the struggle to be the perfect mate to each other when each is riddled with their own insecurities, all this and more is beautifully brought to life by the author in this book. Emotional, heartbreaking and even frustrating at times, this a book that had me going misty eyed and then praying for a HEA for the protagonists. The characterization is realistic and I could empathize with the protagonists. All in all, I enjoyed reading The Brigadier's Runaway Bride by Erica Ridley and recommend it to all adult lovers of historical romance. 3.5 out of 5 to it and I hope to read more from Erica in the future.